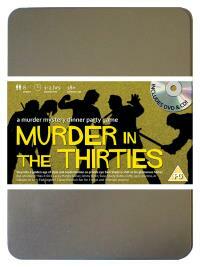 You've been invited to play the role of LADY FADDINGTON in Murder in the Thirties. Who shot Sam Shady? Rooseville, 1931. Sam Shady, private eye to the stars, is celebrating his birthday in style. He’s invited all his current clients, as well as his closest rival, to dinner at his classy house. As his guests are getting to know each other before the first course arrives, Sam steps outside for a quiet smoke and shortly afterwards, he is found lying dead in the middle of his lawn. Find out who made Sam’s birthday go with a bang! Famous actress (queen of the casting couch!) Costume : You wear a long glamorous dress and long satin gloves. Precious stones casually hang around your neck and a feather boa drapes across your shoulders. Elegant high-heeled shoes complete the picture. Beautiful, graceful and enigmatic, you are a well-loved star of the stage and screen, travelling by public demand between London, New York and Paris to play some of the most prestigious roles. Your luxurious lifestyle is legendary and you leave a string of broken hearts in every city. You met Sam Shady recently at one of your plays and the two of you hit it off straight away.